History, Romance, and SPIES! A Guest Post With Roseanna M. White! Friends, I want to introduce you to Roseanna M. White. She is one talented lady. Publisher, Writer, Editor, Home Schooling Mama, Friend, Blogger…She does everything. Enjoy this guest post! Yes, okay, I’m one of those. The people who just love stories of intrigue. I’ve read Robert Ludlum. I’ve watched all the Bourne movies, all the James Bond movies. I move books from my “read someday” pile to my “read NOW!” pile if I spot the word “spy” or “espionage” in the back cover copy. What can I say? They’re just so stinkin’ cool! But alas, all my books were just historical or historical romance. I had wars, I had betrayal, but something as awesome as spies? Sigh. Nope, not me. And as I prepared for the release of Love Finds You in Annapolis, Maryland, I decided that was just a cryin’ shame. As I was putting away laundry one day (a rare feat in my house, I assure you), I was noodling ideas for another book with a similar setting to Annapolis (which is 1783) and called to mind something my husband had been watching on TV a few days before. Notice I said he had been watching it. I’d caught the first few minutes of Brad Meltzer’s Decoded and then gotten called away by one of the kiddos. But he had to tell me all about it, because he knew I’d be a sucker for that one, as it combined my love of intrigue with my love of history and told the story of the Culper Ring, America’s first organized network of spies. So I read a little more. And thought they were so cool. I mean, secret signals! Drop locations! Invisible ink! Code names!! They even brought down Benedict Arnold, that website said!!! They’re like…like…like Colonial Bournes. Revolutionary Bonds. Total low-tech action heroes. I eventually bought a really awesome book about the Ring, and received quite an education through it. Namely, that they weren’t exactly as “cool” as I thought. No action heroes. Terrible codes. Nervous dispositions. As many failures as victories–and Benedict Arnold? Yeah…not exactly their handiwork. Still. As the disillusion faded, inspiration replaced it. Because you know what–these people were just like me. Farmers and merchants and sailors and soldiers. Not Jason Bourne or James Bond. Normal. Everyday. Awesome. Yeah, I was pretty glad I decided to give them their own story, and I had so much fun weaving the recorded history around my fictional characters. It was a challenging book to write for quite a while, with the most complicated heroine I’d ever tried to pull off. And I consider it one of my best strokes of genius that I decided my hero should be a socially bumbling chemistry nerd. 😉 The result? A book I so love. And so, I was so thrilled when Harvest House shared my enthusiasm. 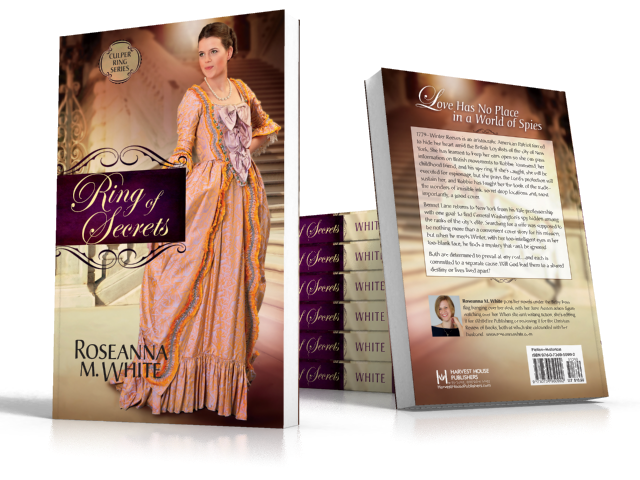 Ring of Secrets just released, and the rest of the series will speculate on what might have happened to the Culper Ring during the War of 1812 and Civil War–fun stuff! And to make the release extra fun, I put together a page where you can figure out YOUR Culper Code Name! Feel free to drop by–and while you’re there, don’t forget to take a gander at my Box of Secrets giveaway, featuring, among other things, a necklace that Susie made, one of a kind! Thanks for having me, Susie! Hey, no problem! This was a very fun post to read! What fun, Roseanna! Loved reading the story’s background. Awesome post! I am so excited for this book! Oh, Roseanna, this was delightful! 🙂 Loved reading it and I look forward to enjoying the book.